Dream Big is such an inspiring and uplifting blog!!! For those of you who send emails asking for me to feature your blog on my page I am more than happy to oblige. I select blogs for my “Today’s Featured Blog…” from those who comment and LIKE, but mostly comments. I scroll through my Notifications and see if I can find an interesting post from those who have interacted with me. So if you would like to be considered for the Featured post all you have to do is engage and you increase your chances 10 fold. I hope everyone has a wonderful Sunday! A magazine inspired by a poet…why did the poet imagine his house so bleak? Vintage magazine “House Beautiful” combined with “Home & Field” published in January 1934. Bleak without and bare within. Robert Louis Stevenson’s house in Samoa seemed far from bleak! Perhaps Stevenson’s imagination changed the vision that he insisted was his home. And so…House Beautiful magazine was created. Eugene Klapp was a civil engineer in Chicago who had an eye for home design and home improvement. He was an early DIY devotee long before the term DIY was even created. In December of 1896, Klapp created House Beautiful, a women’s magazine dedicated to interior design, architecture and gardening. For financial help in beginning the magazine, Klapp sought the help of his friend Henry Blodgett Harvey. And bleak and bare houses became an impetus to imagine and create pleasant and pleasing home environments. We send our gratitude to Robert Louis Stevenson for his influence! This room could be an opulent style candidate! The articles included multiple pictures of the “poor taste” houses that the editors had in mind and even named the owners of the houses. The decor of such houses was blatantly called “ostentatious”! Most of the readership liked the articles and the circulation of House Beautiful grew! “Fat with advertising, used color lavishly , and maintained its original principle of sensible spending for good construction and furnishings”. House Beautiful strives to maintain their dynamic and original philosophy: “to always be warm and welcoming, to inspire, to surprise and delight, and always be engaging and fun”…according to Hearst Integrated Media. Robert Louis Stevenson inspired a magazine to bring a sense of peaceful sanctuary into the home environment. Counting From One to Three. Singer/songwriter David Broza expresses his innermost feelings about the struggle for peace in his critically acclaimed 2014 album, East Jerusalem/West Jerusalem. East Jerusalem/West Jerusalem with David Broza. The album and coordinating short film co-produced by my cousin, Steve Earle. David Broza and Steve Earle…serious thinkers and seriously talented people. The struggle for peace exudes through our world…across hills and mountains and valleys…across borders near and far. It seems that peace has somehow become an illusion…a commodity that is deeply hidden in the mire of political as well as societal differences. It is said that music is the universal language, the essential and common language…the language that can bring people together from across the spectrum. I believe in the possibility that the previous statement is true…David Broza evidently holds the same belief. The words to the song, “One to Three” are a sad reality. Broza seems to be saying that peace can possibly be reached through people talking freely and openly about their differences. There is fear. There is intimidating behavior. It seems that there is a lack of trust on each side of any disagreement. Naive? Perhaps. However, beginning with the language of music is a beginning that should not be ignored where any bit of hope exists. My portion of the B&W Photo Challenge is completed! Through the process, I found myself remembering the many hours that I spent in the photo lab in college. I was so thrilled to learn how to develop film and how to take B&W pictures that would pop on the newspaper page. Evidently, I forgot everything that I learned in the darkroom! I still have my favorite photos from college (naturally!) …the ones that I enlarged and mounted. I have no idea what I thought I would do with those mounted pictures! When I get the nerve, I will look at them again! I think that they are in the attic…what a very risky thought! Day #1…Top of the Rock at Big Cedar Lodge in Missouri. Day #2…Our son’s 1958 Chevrolet ApacheTruck. Day #3…Halloween (very loud) owl in the tree. Day #4…Top of wooden covered bridge at Big Cedar Lodge in Missouri. Day #5…Shenandoah National Park in Virginia. Day #6…Card from one of my Kindergarten students. Day #7…Fence post at our farm with barn in the background. Seven Days. Seven B&W Photos… Challenge #7. This challenge is to post seven black and white photos…no people, no explanation …photos of everyday life…for seven consecutive days. You will need to challenge one new blogger each day! A FAVORITE CHILDHOOD BOOK! AND SHE WORE A CLOAK!!! What an exciting birthday present! I was thrilled to receive a Madame Alexander doll…just like the one pictured above…. when I was six years old. I still have it… although my doll is not as pristine as the one in the picture. Of course, I still have it! If you have read some of my older posts, you might remember that I still have my senior prom dress, my drill team practice uniforms and my favorite dress from middle school…to name just a few items. NOT A HOARDER! I guess not!! Maybe a slight bit!! Maybe a lot!! However…LITTLE RED RIDING HOOD!!! I still love the red cloak that she wore and the independent way she acted. I cannot believe that she had so much freedom. Those were different times! 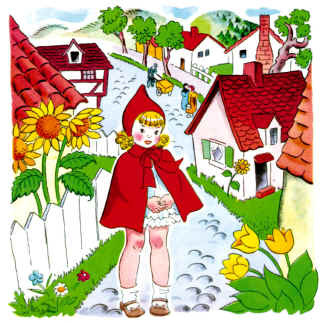 READ LITTLE RED RIDING HOOD AGAIN…A CHILDHOOD MEMORY FOR MANY OF US!! One morning, Little Red Riding Hood asked her mother if she could go to visit her grandmother as it had been awhile since they’d seen each other. “That’s a good idea,” her mother said. So they packed a nice basket for Little Red Riding Hood to take to her grandmother. When the basket was ready, the little girl put on her red cloak and kissed her mother goodbye. But when Little Red Riding Hood noticed some lovely flowers in the woods, she forgot her promise to her mother. She picked a few, watched the butterflies flit about for awhile, listened to the frogs croaking and then picked a few more. Suddenly, the wolf appeared beside her. “What are you doing out here, little girl?” the wolf asked in a voice as friendly as he could muster. “I’m on my way to see my Grandma who lives through the forest, near the brook,” Little Red Riding Hood replied. Then she realized how late she was and quickly excused herself, rushing down the path to her Grandma’s house. The wolf, a little out of breath from running, arrived at Grandma’s and knocked lightly at the door. “Oh thank goodness dear! Come in, come in! I was worried sick that something had happened to you in the forest,” said Grandma thinking that the knock was her granddaughter. The wolf let himself in. Poor Granny did not have time to say another word, before the wolf gobbled her up! The wolf let out a satisfied burp, and then poked through Granny’s wardrobe to find a nightgown that he liked. He added a frilly sleeping cap, and for good measure, dabbed some of Granny’s perfume behind his pointy ears. A few minutes later, Red Riding Hood knocked on the door. The wolf jumped into bed and pulled the covers over his nose. “Who is it?” he called in a cackly voice. “Oh how lovely! Do come in, my dear,” croaked the wolf. When Little Red Riding Hood entered the little cottage, she could scarcely recognize her Grandmother. “Grandmother! Your voice sounds so odd. Is something the matter?” she asked. “Oh, I just have touch of a cold,” squeaked the wolf adding a cough at the end to prove the point. “But Grandmother! What big ears you have,” said Little Red Riding Hood as she edged closer to the bed. “The better to hear you with, my dear,” replied the wolf. “But Grandmother! What big eyes you have,” said Little Red Riding Hood. “The better to see you with, my dear,” replied the wolf. “But Grandmother! What big teeth you have,” said Little Red Riding Hood her voice quivering slightly. “The better to eat you with, my dear,” roared the wolf and he leapt out of the bed and began to chase the little girl. Almost too late, Little Red Riding Hood realized that the person in the bed was not her Grandmother, but a hungry wolf. She ran across the room and through the door, shouting, “Help! Wolf!” as loudly as she could. A woodsman who was chopping logs nearby heard her cry and ran towards the cottage as fast as he could. The woodsman knocked out the wolf and carried him deep into the forest where he wouldn’t bother people any longer. Little Red Riding Hood and her Grandmother had a nice lunch and a long chat.